Championship side Nottingham Rugby have signed back-row forward Paul Grant from Montpellier for next season. Grant joined the Top 14 leaders from New Zealand provincial club Otago as injury cover for France international Fulgence Ouedraogo in November. "He is an excellent leader as he demonstrated as captain of Otago," said Nottingham boss Martin Haag. The 26-year-old is Nottingham's third new signing, joining fly-half Dan Mugford and Tonga winger Viliame Iongi. Back-row forwards Tom Calladine and Rupert Cooper have also recently signed contract extensions at Meadow Lane. 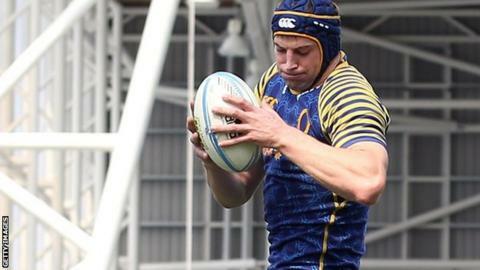 Grant's move to English rugby sees him link up with former Otago team-mate Sean Romans, who has also recently committed to the club for another year. Nottingham, third-from-bottom in the Championship, were forced to cut their playing budget this season after finishing second in the table last term. The club was saved from liquidation in January after securing £750,000 of new investment over the next three years.